Sophomore Outside Hitter, #10, Rylee Storms (left), Freshman Outside Hitter, #9, Lena Thompson (middle left), Sophomore Defensive Specialist, #8, Kylie Frank (middle right) and Freshman Outside Hitter, #7, Hailey DeKorte (right) during the announcement of rosters before the game. 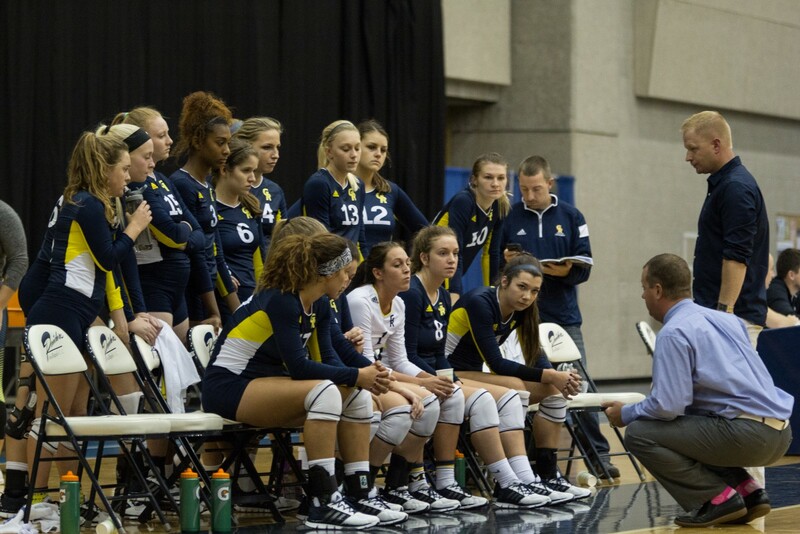 GRCC Head Coach Chip Will speaks the team during a timeout in the first set. 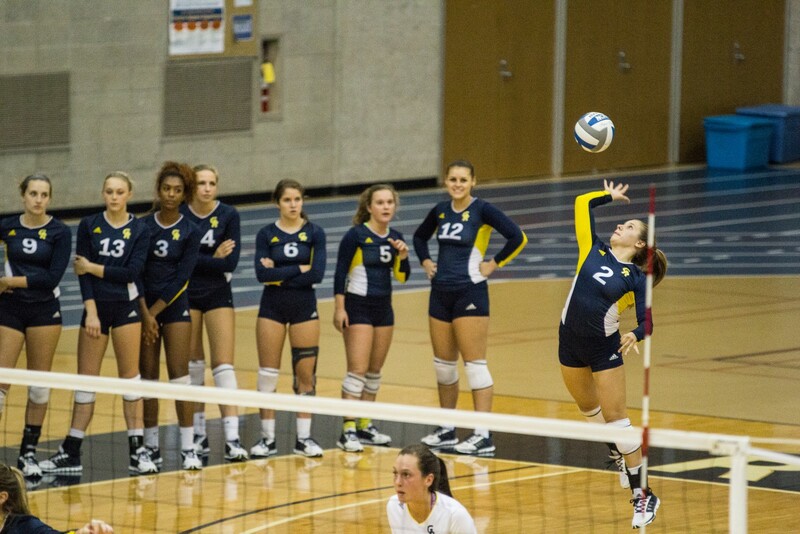 Sophomore Libero, #1, Janie Bunge serves the ball to Muskegon CC during the first set. 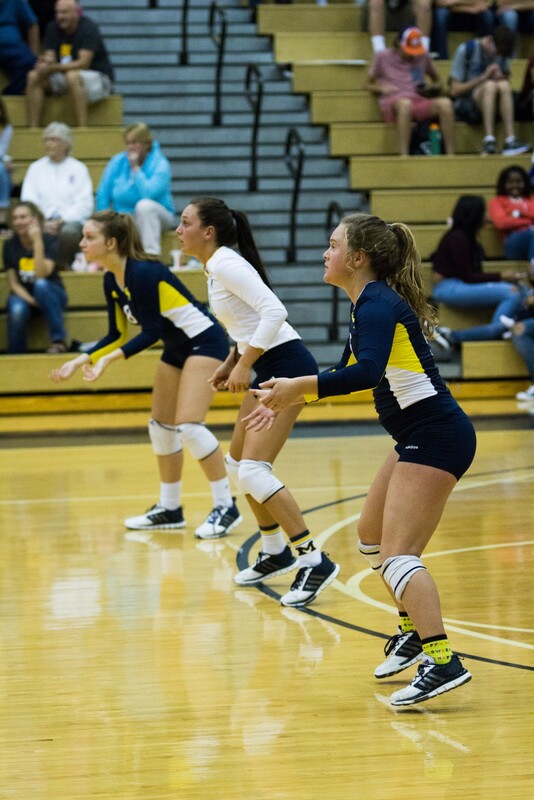 Sophomore Defensive Specialist, #8, Kylie Frank (far), Sophomore Libero, #1, Janie Bunge (middle) and Freshman Defensive Specialist, #5, Kennedy Potts wait to receive a serve from Muskegon CC. 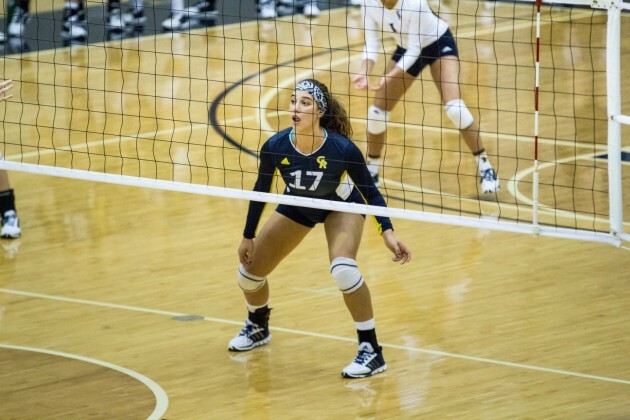 Sophomore Middle blocker, #17, Toryanna DeYoung gets set to receive a serve from Muskegon CC. 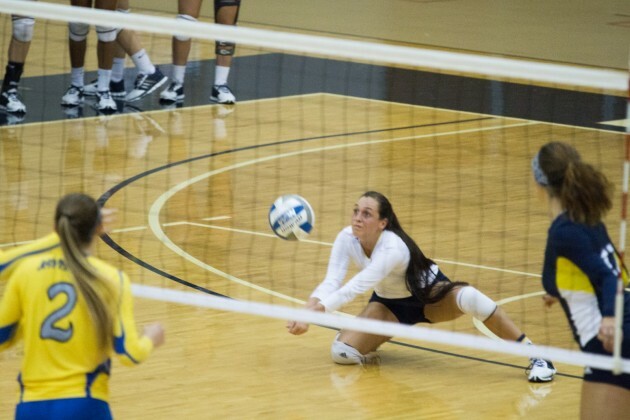 Sophomore Libero, #1, Janie Bunge digs the volleyball to keep the ball in play. 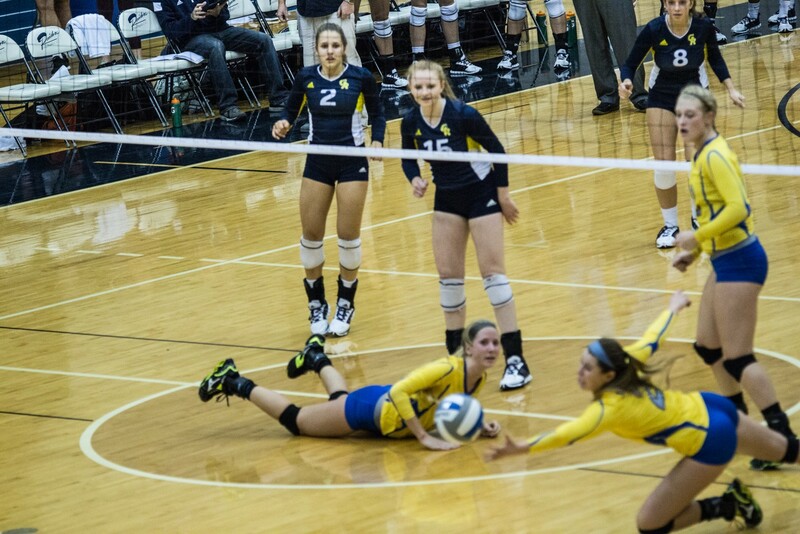 Muskegon CC tries to stop a spike from Sophomore Outside Hitter, #15, Emily Farwell, but is unsuccessful. Sophomore Outside Hitter, #15, Emily Farwell (left) and Freshman Outside Hitter, #12, Olivia Reams try to block a spike from Muskegon CC's Freshman Outside Hitter, #9, Delaney Bennett. 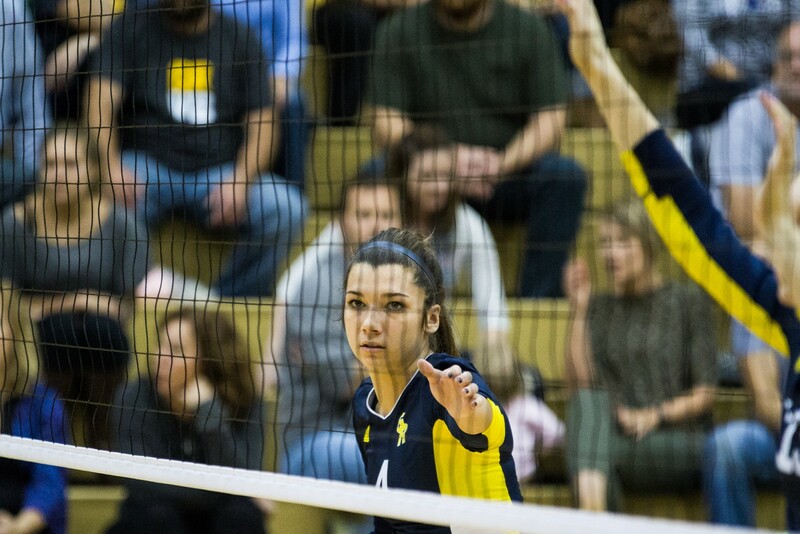 Sophomore Outside Hitter, #4, Lauren Wieber prepares to play another point during the first set. 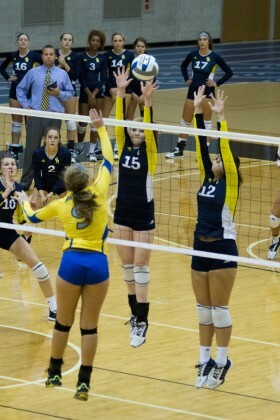 Freshman Setter, #2, Lauren Helsen serves the ball to Muskegon CC. 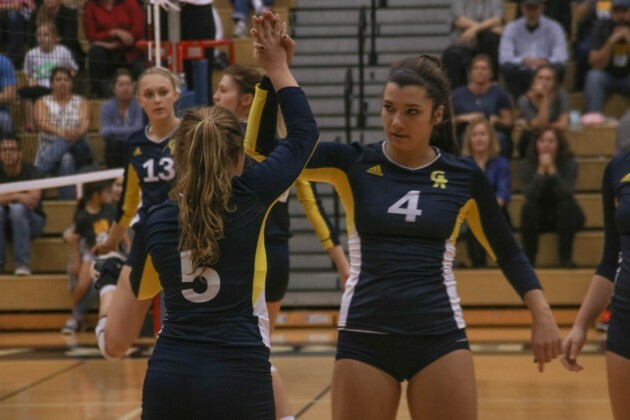 Assistant Coach David Rawles coaches Freshman Setter, #2, Lauren Helsen during a GRCC timeout. 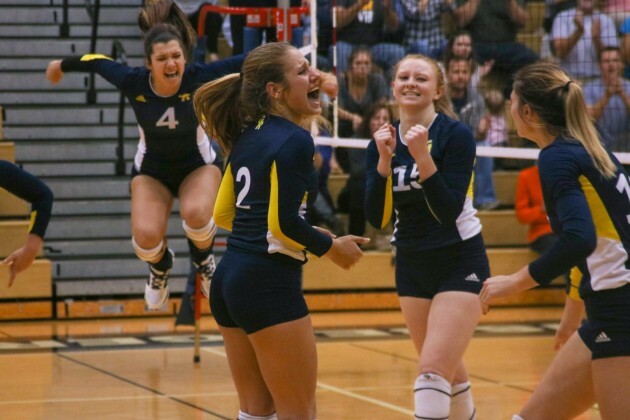 Freshman Setter, #2, Lauren Helsen among other GRCC volleyball players yelling and cheering as they score a necessary point in the fourth set. 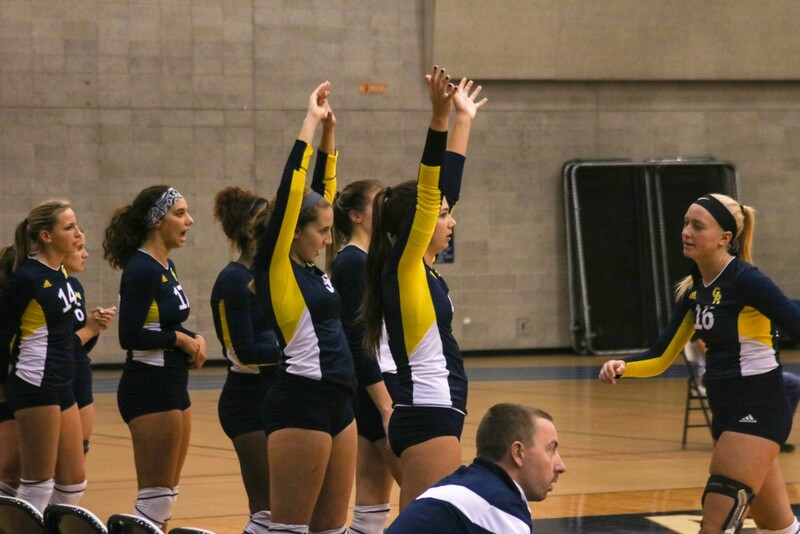 Freshman Outside Hitter, #9, Lena Thompson (left) and Sophomore Outside Hitter, #4, Lauren Wieber (right), among the players on the bench, putting their hands up to cheer on the team during the game. The GRCC volleyball team keeping the energy positive during the match against Muskegon CC. The GRCC volleyball team Head Coach, Chip Will, talking to the team about how to stay focused during the match. Freshman Defensive Specialist, #5, Kennedy Potts (left) substitutes in for Sophomore Outside Hitter, #4, Lauren Wieber (right). 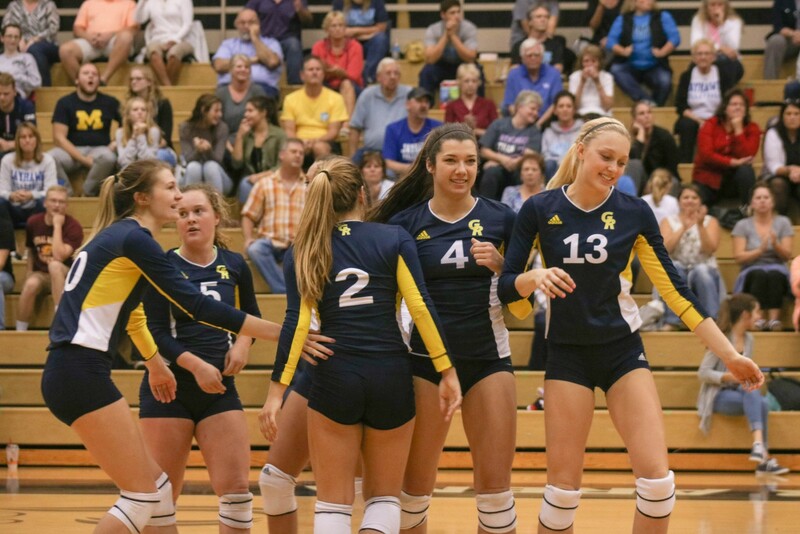 All smiles for the GRCC volleyball team as Freshman Middle Blocker, #13, Hannah Sterns (left), Freshman Setter, #2, Lauren Helsen (middle left), Freshman Outside Hitter, #9, Lena Thompson (middle middle left), Sophomore Libero, #1, Janie Bunge (middle middle right), Sophomore Defensive Specialist, #8, Kylie Frank (middle right) and Freshman Outside Hitter, #7, Hailey DeKorte (right) group together for a photo while there was a pause in action during the fifth set. 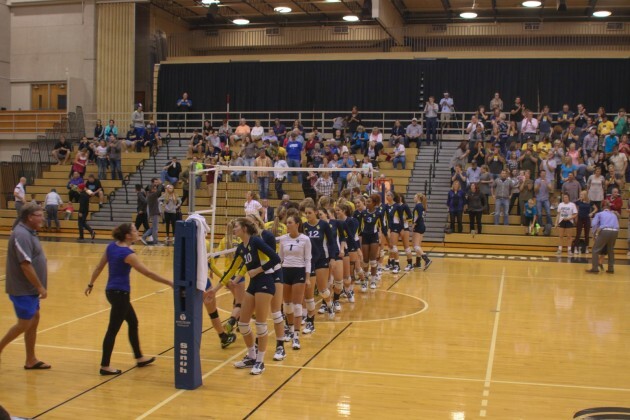 During the fifth set, the GRCC Raiders keep the energy positive and fun by dancing to the "Cupid Shuffle" song while there was a review about a substitution for GRCC. The GRCC Raiders and Muskegon CC Jayhawks shake hands after GRCC clinches the number one seed in the MCCAA western conference, winning 3-2. 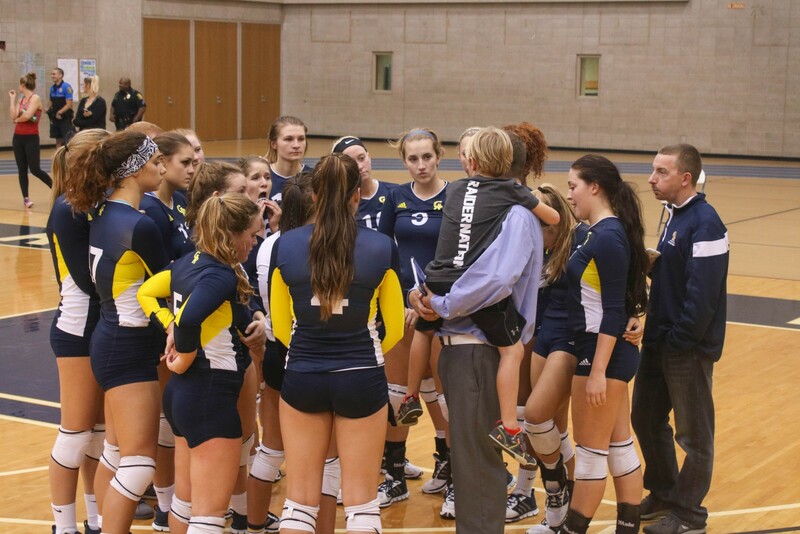 The GRCC volleyball team getting a post-game speech from Head Coach Chip Will. 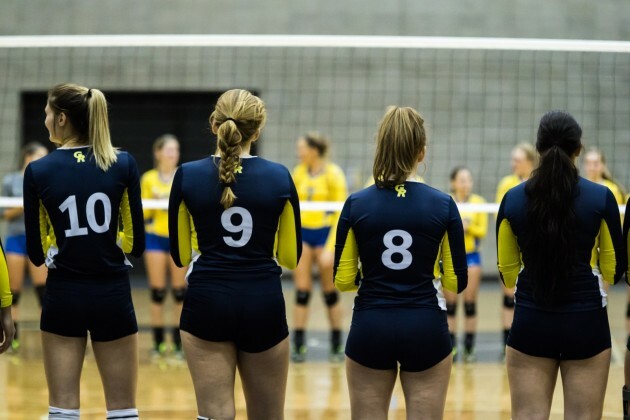 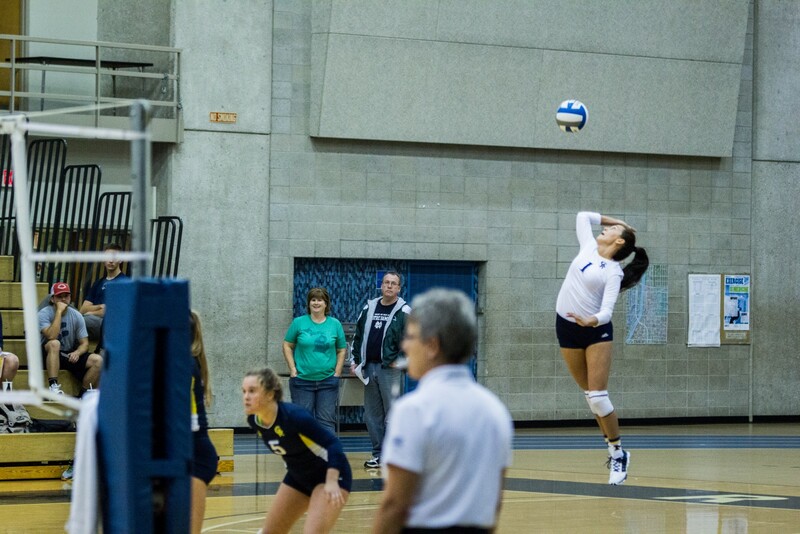 The Grand Rapids Community College volleyball team stayed undefeated in the Michigan Community College Athletic Association (MCCAA) western conference Tuesday, beating a tough Muskegon Community College, 3-2. 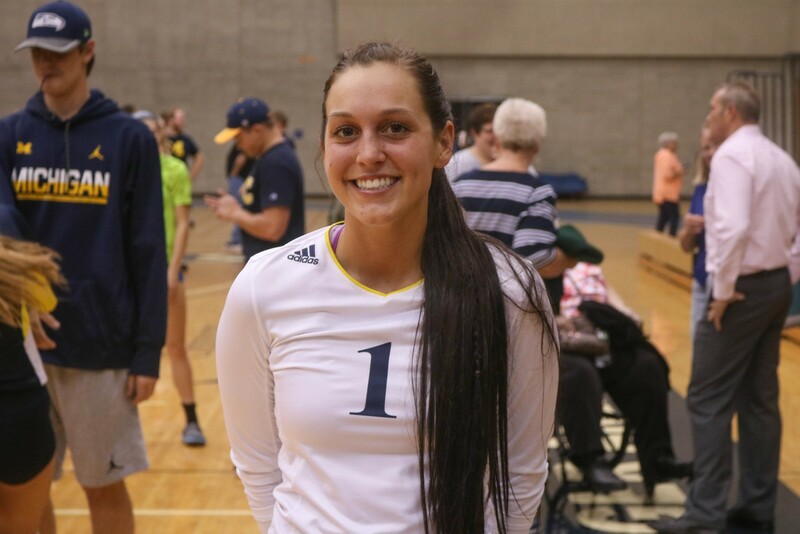 The entire match was a roller coaster of performances, with the first set being “the worst they could’ve played” according to Sophomore Libero Janie Bunge. 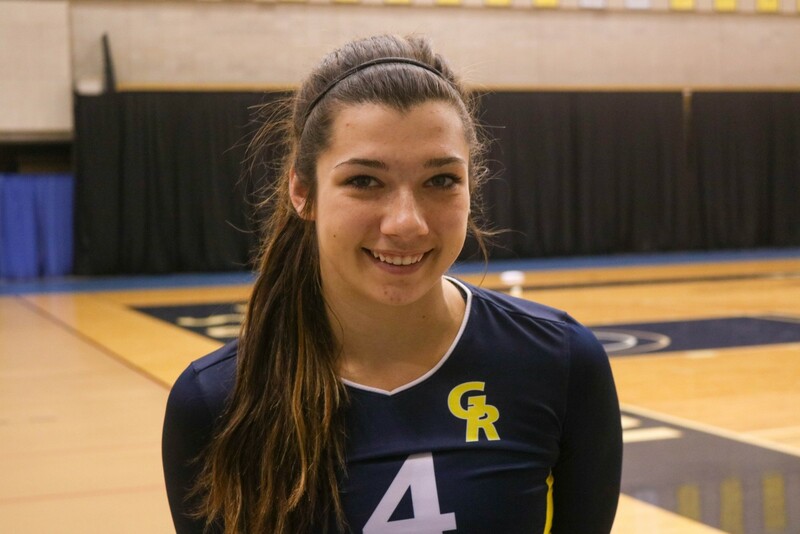 [/media-credit] Sophomore Libero, #1, Janie Bunge. The team has struggled all season with starting strong, but even with repeating that same bad habit, they were still able to turn things around and step up their game. 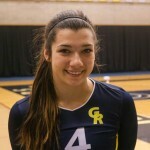 [/media-credit] Sophomore Outside Hitter, #4, Lauren Weiber. Knowing what to say to different teammates during rough spots of matches is important, according to Sophomore Defensive Specialist Kylie Frank. [/media-credit] Sophomore Defensive Specialist, #8, Kylie Frank. 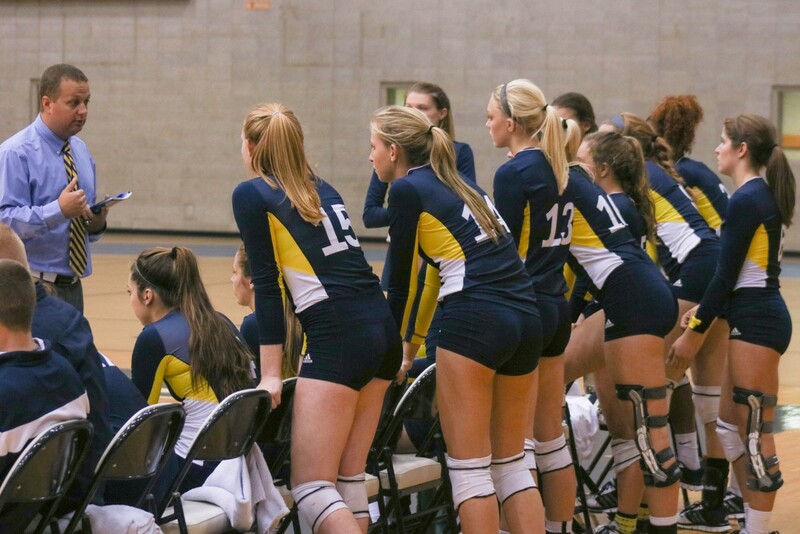 With team chemistry and “having each other’s back”, the Raiders started to improve throughout the sets, ultimately winning the match, and becoming No. 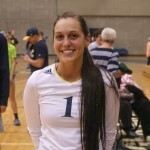 1 in the MCCAA western conference. 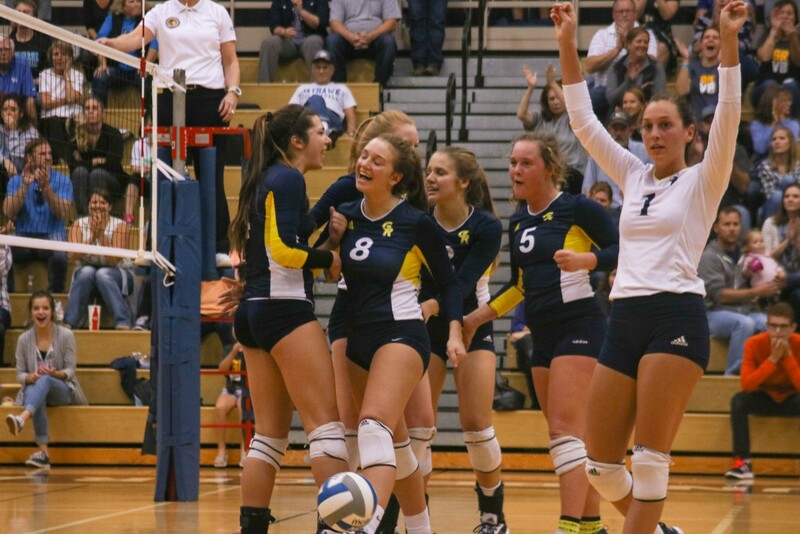 [/media-credit] The GRCC volleyball team gets fired up as they score a point against Muskegon CC during the fifth and final set of the night. 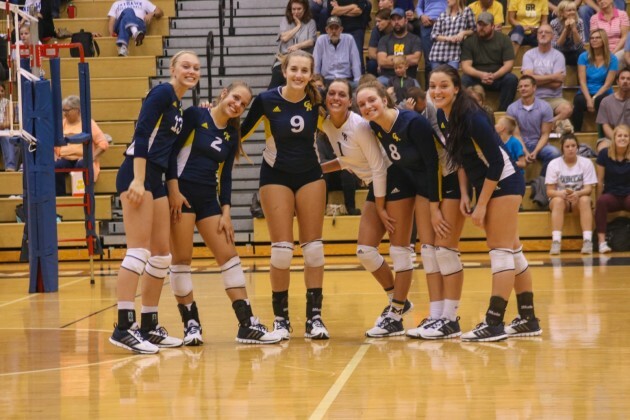 “When we play Muskegon, it’s always a battle and we want to completely massacre them every time,” Bunge said. 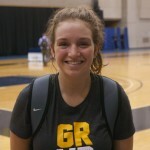 The match was a game of tug-a-war, with GRCC losing the first set 14-25, rebounding and winning the second set, 25-18, only to drop the third set, 21-25, to then barely win the fourth set, 26-24, and close the game with a fifth set win, 15-11. 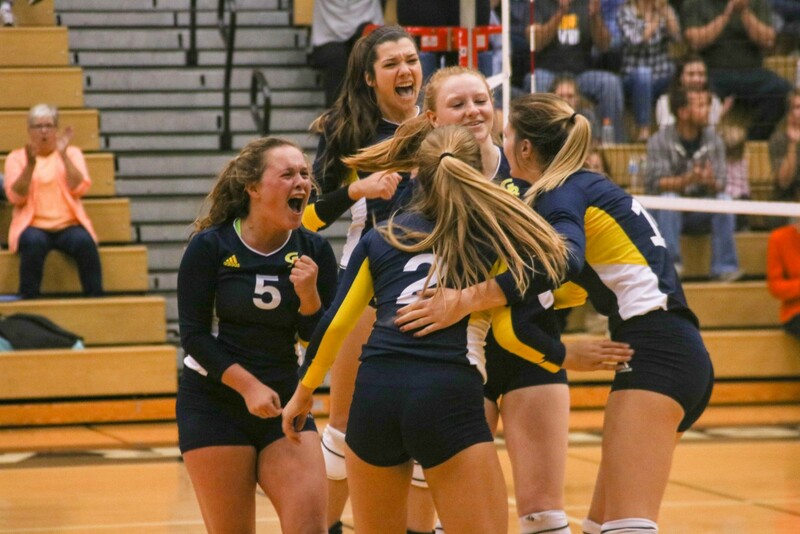 [/media-credit] Energy and emotion break through as the GRCC volleyball team gains momentum against Muskegon CC. 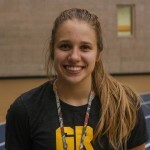 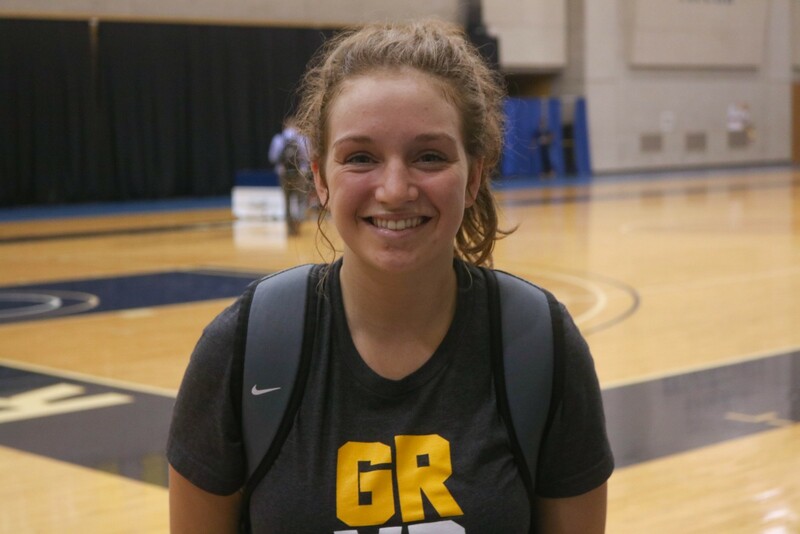 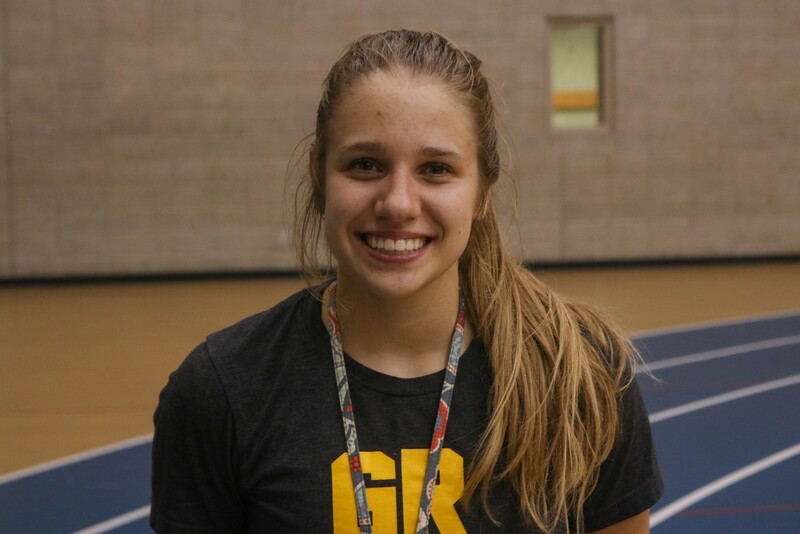 The freshman players for GRCC “have to learn how to work through pressure situations,” Will said. 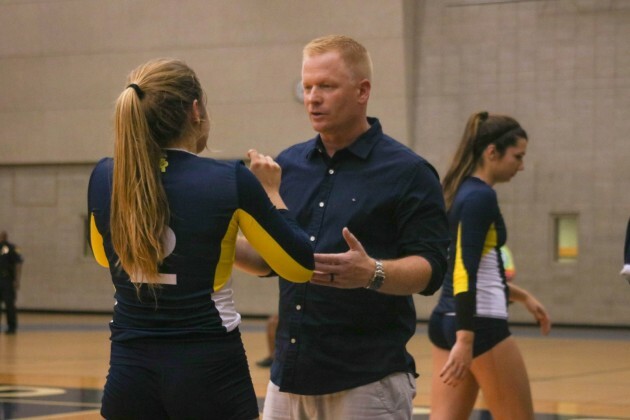 “You can’t just say that there’s pressure at a random time, you have to let them experience it and I think we showed that we have faith in the kids to execute and at the end of the night, they did,” he said. Overall, it was a learning opportunity, not only for the players, but for the coaches as well. 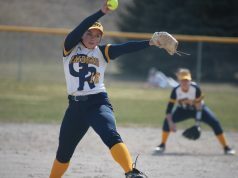 GRCC will be looking to keep this momentum going as they finish out the regular season with only three games left. 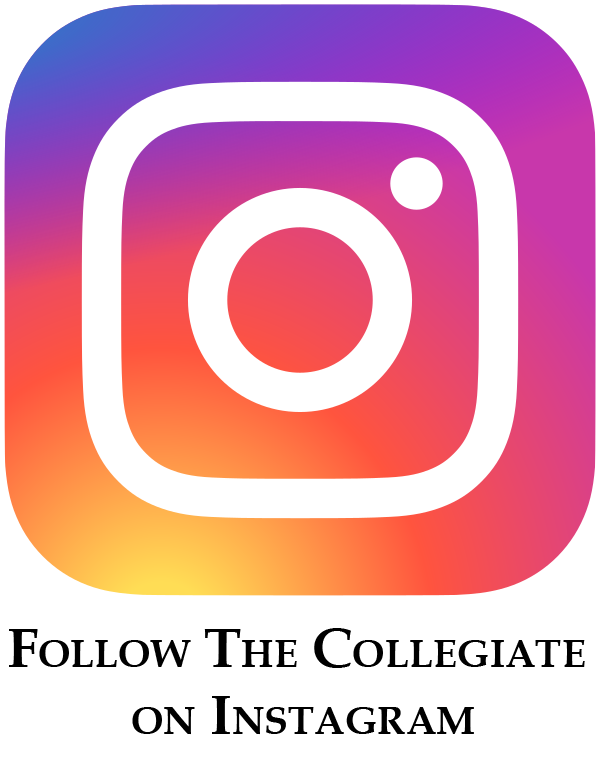 The next match for GRCC will be at 6:30 p.m. Thursday, Oct. 20, at Kellogg Community College, 450 North Avenue, Battle Creek. 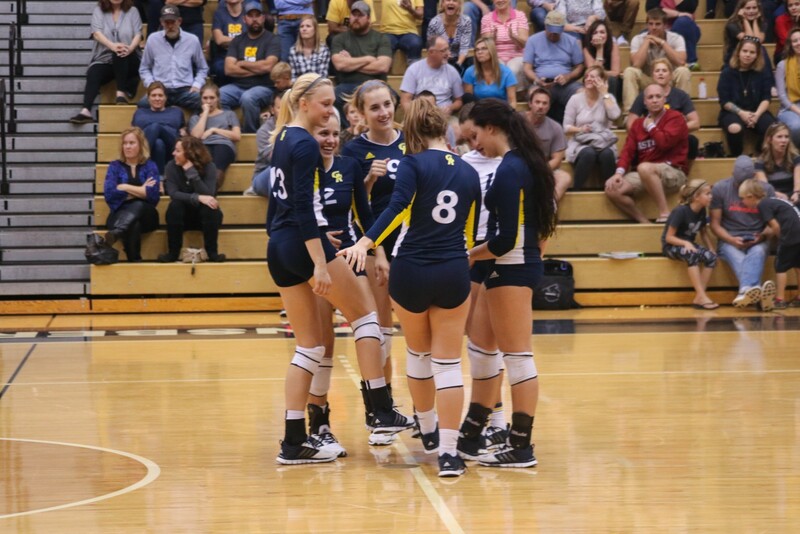 The next home match will be at 6:30 p.m. Tuesday, Oct. 25, against Ancilla College, at the GRCC Ford Fieldhouse.